WFTDA Championships Final to be Carried on ESPN3 in U.S. The milestone agreement has the potential to bring roller derby to a new and larger audience. Roller derby is on ESPN. The WFTDA has announced that it has signed an agreement with ESPN to broadcast of the final day of the 2015 WFTDA Championships from St. Paul, Minn. on ESPN3, the online streaming channel of the ESPN mothership. The terms of the deal give ESPN3 exclusive rights to live streaming and a 30-day replay window in the United States for the last four bouts of Championships weekend, including the Division 1 and Division 2 third- and first-place games. The WFTDA will maintain control of the presentation, using the ESPN3 channel of the WatchESPN service as a broadcast portal. The first two days of WFTDA Champs, along with the six Division 1 and Division 2 playoff tournaments, will be made available via Pay-Per-View on WFTDA.tv as they have been in previous years. The arrangement does not apply to international markets. Every game at Championships will be broadcast outside the United States through WFTDA.tv as normal. 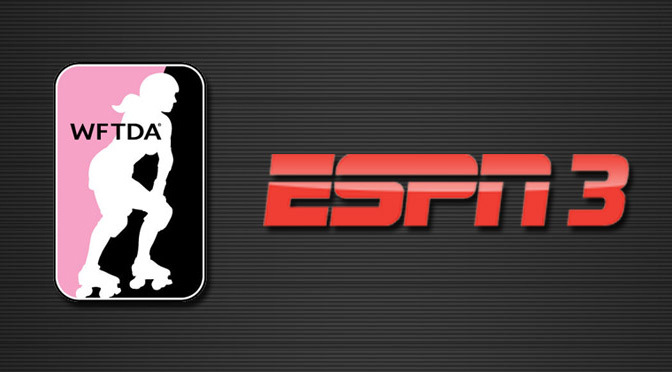 Under the exclusivity arrangement, Americans must use ESPN3 to watch the 2015 Hydra final as it is happening, or in replay in the month following. Archives will still be posted to the WFTDA YouTube page after 30 days, but if you’ve got to see it live, you must do so on ESPN3 even if you purchase a WFTDA.tv streaming pass. 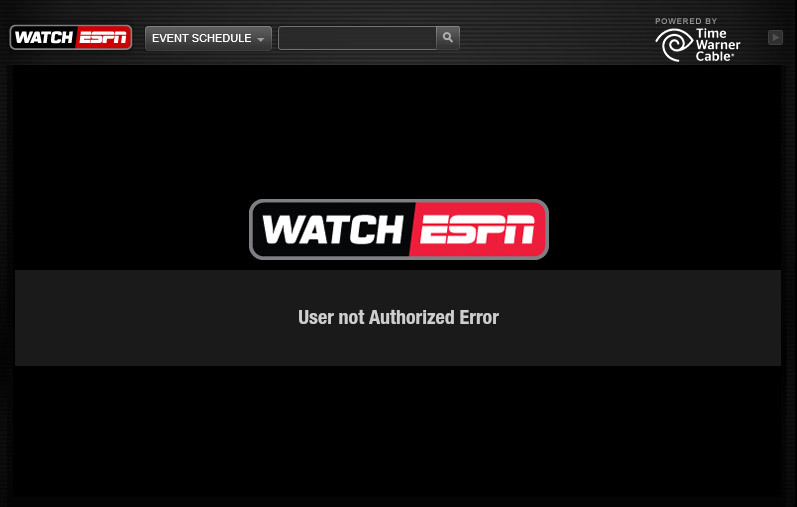 However, ESPN3 programming is not freely available in the same way that videos from any other streaming website are. The channel can only be accessed by those that pay for monthly cable TV subscriptions that include ESPN, or to users of ISPs that have paid ESPN to allow their subscribers to watch ESPN3. “ESPN3 is available via online streaming and the WatchESPN app to anyone whose Internet or cable provider has a contract to carry ESPN,” the WFTDA takes care to note. (ESPN3 access is freely available on college campuses and military bases.) If you’re a cord-cutter that doesn’t pay for cable TV, you need to hope your ISP has ponied up to ESPN for ESPN3 access rights. The WFTDA-ESPN3 deal will leave some in the dark on the last day of WFTDA Championships, particularly those that use Time Warner Cable Internet but don’t have TWC Cable TV. Time Warner explicitly bans ESPN3 access to its Internet-only subscribers. But consider the bigger picture. Though ESPN3 does not have the same popularity or notoriety as do its older brothers at ESPN and ESPN2, the simple fact of the matter is that the potential audience on ESPN3 completely dwarfs what the WFTDA could ever hope to reach through WFTDA.tv by itself. Some numbers: ESPN, the cable TV network, has nearly 100 million paying subscribers.1 Technically, all of them have access to ESPN3. But as Internet TV is still a developing movement, only a minor percentage have taken advantage of the service. For instance, during the FIFA World Cup last year, a record (for ESPN) 14.7 million users logged on to WatchESPN to watch at least some of the global soccer tournament. Even if you take a tenth of that crowd—hell, even 1% of it—the WFTDA is looking at potential sports audience that is at least two orders of magnitude larger than the thousands of derbyfolk that have been watching live WFTDA.tv tournament broadcasts at any given moment in time. Even pessimistically, the potential is staggering. However, this arrangement must work for both parties. ESPN doesn’t provide this kind of access, even for just a day, unless it’s seeing enough money to make it worth their time and resources. In fact, the agreement makes it appear as if ESPN is testing the waters, to see if broadcasting flat track roller derby on its online platform is worthy of the power of its brand name. The terms of the deal, as reported by the Austin Business Journal, has the WFTDA receive no dollars for granting ESPN the right to carry the online broadcast in the United States. Instead, the WFTDA will get a percentage of the revenue generated through advertising sales. The hope is that the much larger potential audience on ESPN3 will justify charging higher ad rates from sponsors, making up for the revenue lost by giving away its most-watched live games for free. On the other side of the literal coin, putting a broadcast on an ESPN platform requires a much higher standard of quality—at a much greater expense. The WFTDA must “hire a high-end production company,” reports the Journal, to make sure its broadcast from The Roy Wilkins Auditorium in Minnesota is up to snuff. The deal includes an extension option for 2016, which must be mutually agreed upon by the WFTDA and ESPN. Depending on how things go this year, there is the possibility of more coverage on ESPN3 beyond just the last day of the finals. All told, the WFTDA is paying to be put on ESPN, which is not an unusual arrangement for new sports attempting to break out to new audiences. However, with no truly mainstream sponsors or large general audiences to support the WFTDA and their member leagues at this time, the organization appears to be once again relying on the roller derby community to help fund this endeavor. Soon after the WFTDA revealed the broadcast partnership, it opened up the sale of WFTDA.tv streaming passes for each of the seven tournament weekends. Unsurprisingly, they are all more expensive than they were last year. The $60 Division 1 bundle pass will save you some bucks over buying each weekend separately, but even that’s a 20% increase from 2014 and doesn’t include the D2 streams, which must be added a la carte. The WFTDA is offering a 10% off coupon code for any pass purchase made before August 20, which helps defray the price increases. (It offered the same early bird discount last year when passes were cheaper.) Still, on the surface it appears that the WFTDA may be relying just a bit more on the community to help fund its push to a much, much wider audience. What will the WFTDA make of this new opportunity? You can find out by sticking with Roller Derby Notes during the entire playoff 2015 WFTDA season, including Championships, with tourney previews, analysis, and insight! This article was updated on August 11 with more details on the terms of the WFTDA-ESPN agreement. Previous PostThat Time They Played WFTDA Derby on the Banked TrackNext PostWFTDA Division 2 Playoffs: Cleveland Rocks! But let’s not get too ahead of ourselves. Roller derby had enormous potential five years ago, too. We saw what happened after that. A big audience is only useful if they (and their dollars) want to keep coming back.